On The Road To Polio Eradication In Pakistan : Shots - Health News Pakistan is one of the last three countries to still have entrenched polio. To eradicate the virus, a group of "social mobilizers" travels to hard-hit slums to help overcome social and physical barriers to vaccination. 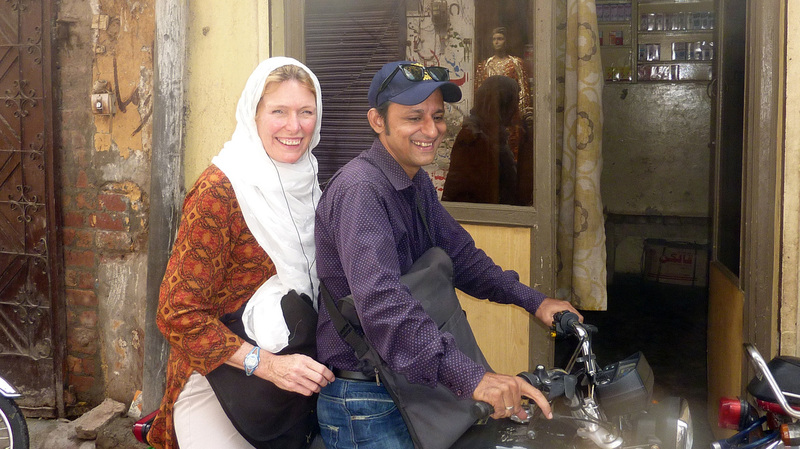 NPR's Jackie Northam travels through the urban slums of Lahore, Pakistan, with Omer Feroze, a "social mobilizer," who works on polio vaccine campaigns. As one of the last three countries in the world where polio is still endemic, Pakistan has launched an aggressive campaign to eradicate the virus. It's had good results in many places, but just last week health officials say they discovered three new cases, which they deem a serious setback in their eradication efforts. Getting the polio vaccine to children in urban slums is a huge challenge for health workers, who face many physical and social barriers. As part of my reporting on Pakistan's effort to eradicate polio, I wanted to accompany some so-called social mobilizers. These are the people who lay the groundwork for the vaccinators, help educate people and try to dispel some rumors that have prevented some parents from immunizing their children. One rumor going around is that the polio vaccine will sterilize a child. Another is that the vaccine contains the AIDS virus and that the people dispensing the vaccine are really CIA agents. The social mobilizers talk with religious leaders, women's groups, teachers and the like. In an urban slum of Pakistan, the population is highly transient. People will raise a cloth tent one day, stay a little while and then move on. I was fortunate to come across Omer Feroze, a 37-year-old hired by UNICEF to help educate people in an urban slum in Lahore, a city on the eastern border of Pakistan. The slum contains about 200,000 people, with no public health services, no government schools or offices, and certainly no planning committee. 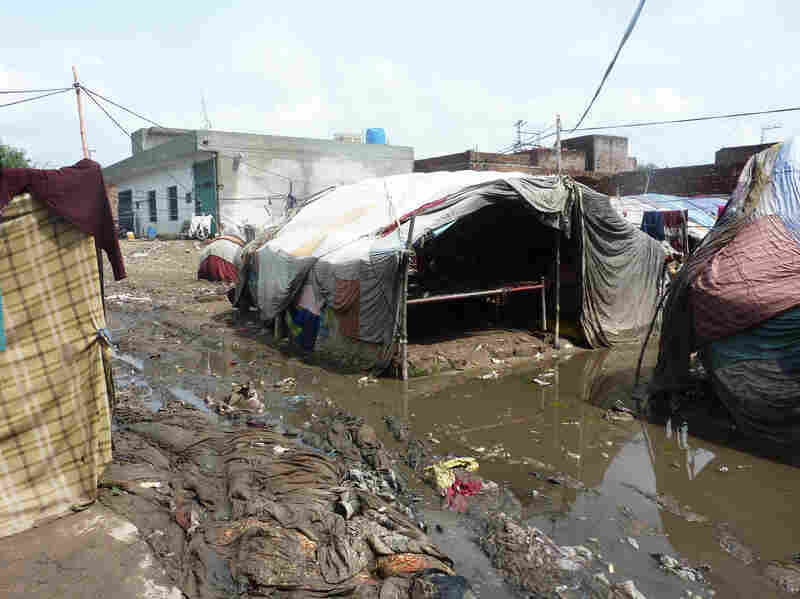 The area is filthy and has no sanitation. It's a perfect breeding ground for the polio virus. It's impossible to drive a car through the areas. The mud tracks are just wide enough for a couple of motorcycles. There were heavy monsoon rains the night before I arrived, leaving the tracks full of deep, thick mud. Several times we had to abandon the motorbike and walk. Feroze and his two colleagues were able to convince an influential imam in the area to give his blessing for the polio vaccine. He now includes it in all his sermons and as a result there is a zero refusal rate in the slum. But there is still a big problem trying to contain the virus because the population keeps shifting. Most of the people in the slum are Pashtun, who come to Lahore from Pakistan's autonomous and volatile tribal region near the border of Afghanistan. Feroze says the Pashtun are nomadic. They will raise their cloth tents on a patch of ground (or mud) one day, stay for a while and then they're off again. Soon enough another family takes their place. The birth rate in this area is about 40 kids per month. There are children everywhere, playing in the mud or donkey excrement, collecting rags and plastic bottles, or simply rocking in a makeshift hammock strung from the roof of a cloth tent.